Battling unsightly blemishes? Then benzoyl peroxide is your new BFF! A topical antibacterial treatment, benzoyl peroxide kills acne-causing bacteria on skin. It also reduces redness and inflammation associated with acne. The result? Clearer skin instantly! How much benzoyl peroxide should you use? Benzoyl peroxide typically comes in 2.5%, 5%, and 10% concentrations, depending on the severity of your acne. 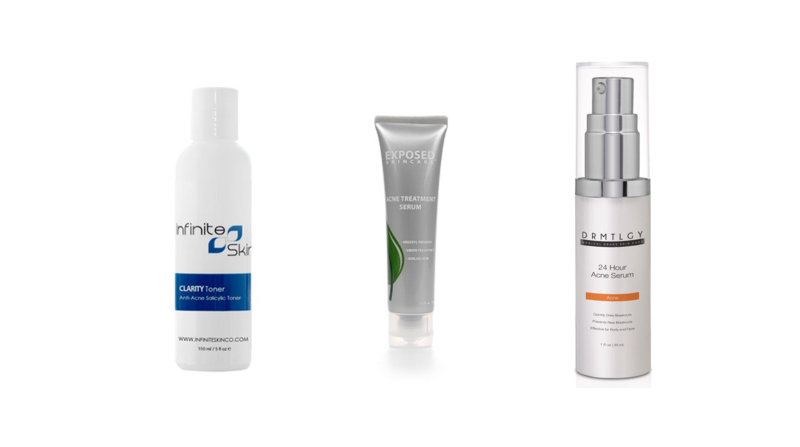 Because benzoyl peroxide can be potent, you should begin by using it every other day. During this time, see how your skin reacts. 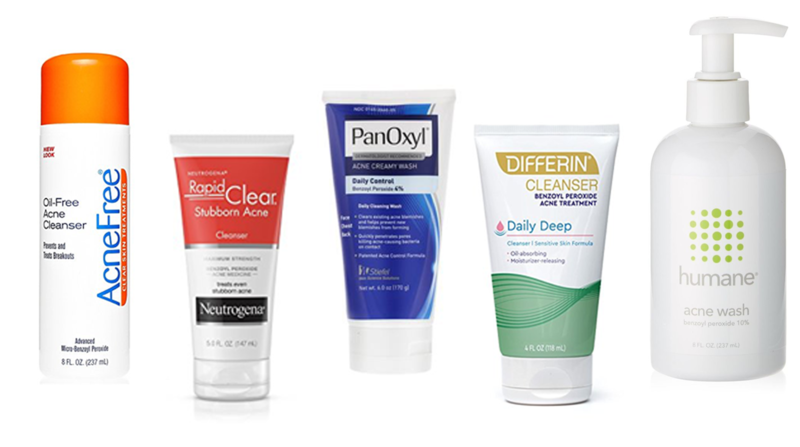 If you don't notice any irritation, redness, or dryness, you can then start using it every day. Don't over-exfoliate. 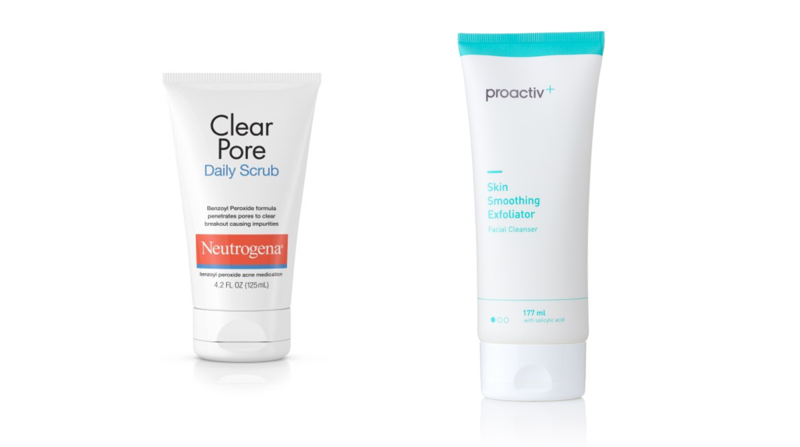 Using a facial scrub can actually make acne worse. This is because it can irritate skin and increase oil production. Only use oil-free moisturizers and cosmetics. The oil found in most moisturizers and cosmetics can clog pores, leading to breakouts. Sanitize your phone. Bacteria easily builds up on phones, and think about all the times you hold your phone up against your face. Bacteria and dirt can easily transfer from your phone to your cheeks, aggravating acne. Make sure to sanitize your smartphone at least once or twice a day using antibacterial wipes. Wash your face regularly. It's important to wash your face twice a day to reduce the buildup of dirt and oil on your skin. This will help to reduce pimples. Stay out of the sun. The sun's rays not only increase inflammation, but they also damage skin. Tanning can make active acne and acne scars far worse. You should always wear a hypoallergenic oil-free facial sunblock before going out into the sun. Exercise. Cardio exercise increases blood flow and helps your body detoxify, resulting in clearer skin. Make sure to shower right after exercising. Eat healthy. Certain foods, especially processed ones that contain sugar and dairy, can make acne worse. Instead, reach for fruits, vegetables, lean meats and whole grains. Benzoyl peroxide is usually the first line of defense in the battle against acne. Tons of skincare products exist that have added benzoyl peroxide, including cleansers, moisturizers, facial scrubs, and topical creams. This skin cleanser contains 2.5% benzoyl peroxide to reduce the frequency and severity of outbreaks. This potent acne cleanser boasts 10% benzoyl peroxide, which is the highest strength. It's clinically proven to reduce size and redness of stubborn acne in just one day. This body and face acne wash contains 5% benzoyl peroxide to clear existing acne blemishes. It also formulated to be gentle on skin. Ideal for those with sensitive skin, this cleanser contains 5% benzoyl peroxide that deeply penetrates pores while releasing a gentle moisturizer. This powerful cleanser contains 10% benzoyl peroxide to reduce serious acne. It's free of parabens, fragrance, SLS, and animal products. This facial scrub contains 3.7% benzoyl peroxide and exfoliating microbeads to kill acne-causing bacteria and unclog pores. This exfoliating face wash contains 2.5% benzoyl peroxide as well as glycolic acid and exfoliating beads to reduce acne and even out skin texture. This facial serum contains 3.5% benzoyl peroxide that helps treat cystic acne. This powerful facial serum contains 5% benzoyl peroxide that deeply penetrates pores. It treats acne breakouts and reduces pimples, whiteheads, and blackheads all within 24 hours. This facial serum combines salicylic acid with benzoyl peroxide to reduce breakouts, treat acne scars, and heal skin. This topical gel contains 2.5% benzoyl peroxide that gently spot treats existing pimples. This acne cream contains 10% benzoyl peroxide, which helps clear up acne and prevents new blemishes from forming. It also contains chamomile, ginger, and sea whip to soothe irritated skin. This acne gel contains 10% benzoyl peroxide that helps treat pimples and prevent breakouts by releasing benzoyl peroxide deep into pores. This acne gel, which contains 10% benzoyl peroxide, is clinically proven to reduce size and redness of stubborn acne in under two hours. This acne cream contains 5% benzoyl peroxide that minimizes stubborn acne, calms redness, and controls excess oil all while hydrating skin to diminish dryness. This acne cream contains 2.5% benzoyl peroxide that kills acne-causing bacteria, preventing new pimples from forming. It absorbs quickly into the skin and works invisibly. 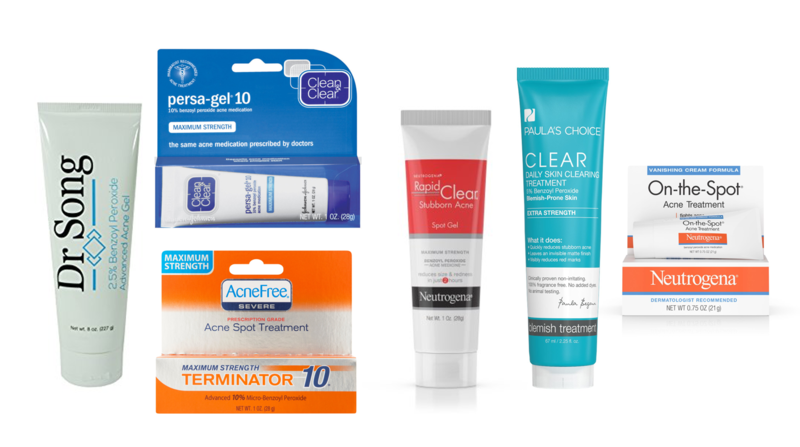 "10 Tips for Preventing Acne," WebMD, n.d.
"30 Beauty Tips: Get Rid of Acne for Smooth Skin," Women's Health, March 16, 2012. "Dr. Pimple Popper Shares Her Best Acne Tips," Allure, December 6, 2016.